The proliferation of online course designs has changed the learning environments for many students and professors. Recommendations for best practice in online course design frequently include maximizing students' online peer connections, with the intention of building a viable, if virtual, online learning community. However, students' responses to and value for these virtual communities have been mixed. Graduate students taking online courses through a state university system were surveyed to determine their value for, and commitment to, this online learning community. Results, both quantitative and narrative, indicated that although some students found the virtual community helpful to their learning, others perceived the online peer connections as superfluous and inconvenient, and not supportive of their online learning processes. We suggest that the new reality created by online learning demands a reassessment of our understanding of the most productive student engagement. LaPointe, L. & Reisetter, M. (2008). Belonging Online: Students' Perceptions of the Value and Efficacy of an Online Learning Community. 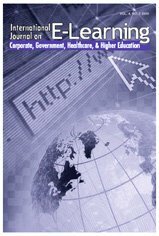 International Journal on E-Learning, 7 (4), 641-665. Waynesville, NC USA: Association for the Advancement of Computing in Education (AACE). Retrieved April 20, 2019 from https://www.learntechlib.org/primary/p/24419/. Allen, M., Bourhis, J., Burrel, N., & Mabry, E. (2002). Comparing student satisfaction with distance education to traditional classrooms in higher education: A meta-analysis. American Journal of Distance Education, 16(2), 83-97. Backward Connections Pty Ltd. (2002). Effective online facilitation (Version 1.01), Australian Flexible Learning Framework Quick Guides Series. Canberra, ACT: Australian National Training Authority. Baard, P.P. (2002). Intrinsic need satisfaction in organizations: A motivational basis of success in for-profit and not-for-profit settings. In E..L. Deci & R.M. Ryan (Eds. ), Handbook of self-determination research. Rochester, NY: The University of Rochester Press. Baumeister, R.F., & Leary, M.R. (1995). The need to belong: Desire for interpersonal attachments as a fundamental human motivation. Psychological Bulletin, 117(3), 497-529. Bickle, M.C., & Carrol, J.C. (2003). Checklist for quality online instruction: Outcomes for learners, the professor, and the institution. College Student Journal, 37(20), 208-215. Billings, D.M., Connors, H.R., & Skiba, D.J. (2001). Benchmarking best practices in web-based nursing courses. Advances in Nursing Science, 23(3), 41-53. Burch, R. O. (2001). Effective web design and core communication issues: The missing components in web-based distance education. Journal of Educational Multimedia and Hypermedia, 10(4), 357-367. Chappell, C., Rhodes, C., Solomon, N, Tennant, M., & Yates, L. (2003) Reconstructing the lifelong learning: Pedagogy and identity in individual, organizational, and social change. New York: Routledge Falmer. Cooper, L.W. (2001). A comparison of online and traditional computer applications classes. Technological Horizons in Education, 28(8), 52-58. Deci, E.L., & Ryan, R.M. (1985). Intrinsic motivation and self-determination in human behavior. New York: Plenum Press. Deci, E.L., & Ryan, R.M. (1996). Need satisfaction and the self-regulation of learning. Learning and Individual Differences, 8(3), 165-184. Deci, E.L., & Ryan, R.M. (2000). The "what" and "why" of goal pursuits: Human needs and the self-determination of behavior. Psychological Inquiry, 11(4), 227-268. Hoskins, S.L., & Van Hooff, J.C. (2005). Motivation and ability: Which students use online learning and what influence does it have on their achievement?. British Journal of Educational Technology, 36(2), 177-192. King, K.P. (2001). Educators revitalize the classroom “bulletin board”: A case study of the Influence of online dialogue on face to face classes from an adult learning perspective. Journal of Research on Computing in Education, 33(4), 337-354. Lally, V., & Barrett, E. (1999). Building a learning community on-line: Towards socio-academic interaction. Research Papers in Education, 14(2), 147-163. Leasure, A.R., Davis, L., & Thievon, S.L. Levesque, C., Stanek, L.R., Zuehlke, A.N., & Ryan, R.M. (2004). Autonomy and competence in German and American university students: A comparative study based on self-determination theory. Journal of Educational Psychology, 96(1), 68-84. McIsaac, M.S., Blocher, J.M., Mahesh, V. & Vrasidas, C. (1999) Student and teacher perceptions of interaction in online computer-mediated communication. Educational Media International, 36(2) 121-131. Moore, M.G. (1989). Effects of distance learning: A summary of the literature. Paper for US Congress, Office of Technology Assessment, Washington, DC. Moss, J., & Hendry, G. (2002). Use of electronic surveys in course evaluation. British Journal of Educational Technology, 33(5), 583-592. Moustakas, C. (1994). Phenomenological research methods. Thousand Oaks, CA: Sage. Navarro, P., & Shoemaker, J. (2000). Performance and perceptions of distance learners in cyberspace. American Journal of Distance Education, 14(2), 15-35. Osterman, K.F. (2000). Students’ need for belonging in the school community. Review of Educational Research, 70(3), 323-367. Paloff, R.M., & Pratt, K. (2001). Barriers to distance education: A factor-analytic study. American Journal of Distance Education, 15(2), 7-22. Perreault, H., Waldman, L., & Zhao, M.A.J. (2002). Overcoming barriers to successful delivery of distance learning courses. Journal of Education for Business, 77(6), 313-318. Peters, O. (2003). Learning with new media in distance education. In M.G. Moore & W.G. Anderson (Eds. ), Handbook of distance education (pp. 87-112). Mahwah, NJ: Lawrence Erlbaum. Reisetter, M. & Boris, G. (2004). What works: Student perceptions of effective elements in online learning. Quarterly Review of Distance Education, 5(4), 277-291. Reisetter, M., LaPointe, L., & Korcuska, J. (2007). The impact of altered realities: Implications of online delivery for learners’ interactions, expectations and learning skills. International Journal of Electronic Learning, 6(1), 55-77. Ryan, R.M., & Deci, E.L. (2000). Self-determination theory and the facilitation of intrinsic motivation, social development, and well being. American Psychologist, 55(1), 68-78. Ryan, R.M., Mims, V., & Koestner, R. (1983). Relation of reward contingency and interpersonal context to intrinsic motivation: A review and test using cognitive evaluation theory. Journal of Personality and Social Psychology, 45, 736-750. Ryan, R.M., Sheldon, K.M., Kasser, T., & Deci, E.L. (1996). All goals were not created equal: An organismic perspective on the nature of goals and their regulation. In P.M. Gollwitzer & J.A. Bargh (Eds. ), The psychology of action: Linking motivation and cognition to behavior. New York: Guilford. Sax, L.J., Gilmartin, S.K., & Bryant, A.N. (2003). Assessing response rates and non-responsive bias in web and paper surveys. Research in Higher Education, 44(4), 409-432. Scantron (2205). EListen survey & Data collection software. Irvine, CA: Scantron Corporation. Tallent-Runnels, M.K., Thomas, J.A., Lan, W.Y., Cooper, S., Ahern, T.C., Shaw, S.M., et al. (2006). Teaching courses online: A review of the research. Review of Educational Research, 76(1), 93-135. Truell, A.D., Bartlett, J.E. II., & Alexander, M.W. (2002). Response rate, speed and completeness: A comparison of internet-based and mail surveys. Behavior Research Methods, Instruments & Computers, 34(1), 46-49.